Hybrid Racing Bolt-In Shifter Box - Dezod Motorsports Inc - Home of the automotive performance enthusiast since 2002. For years, installing a shifter into a K-swapped vehicle meant cutting a large section out of the chassis’ center tunnel to mount an OEM RSX shifter to a metal plate. This meant that the engine swap was more or less irreversible. That’s why Hybrid Racing developed a bolt-in shifter specifically meant for K-swapped Honda and Acura chassis. After nearly a year of design refinements and testing, we are proud to present our new Z3 transmission compatible k-swap shifter. This is the ONLY bolt-in solution for k-swaps using the Z3 transmission from the 8th generation Civic Si’s. Previously, the only way to have a bolt-in solution was to swap out the z3 transmission’s shift mechanism with an RSX unit, then use RSX cables and our original K-swap shifter. Well those days are long gone! Now, you can use an unmodified Z3 transmission and OEM Z3 shifter cables (or our 8th Gen Civic Performance Shifter Cables) in your swap by just bolting in this shifter. This design features an array of improvements over our original K-swap shifters. Among these improvements is a main pivot point that’s designed to dramatically reduce friction and to automatically compensate for wear as the shifter ages. In addition, every pivot point is isolated using Delrin or Teflon to ensure consistently smooth and quiet operation. A new design philosophy was incorporated into many of the joints to simplify the design while reducing unwanted play between parts. And as always, we have designed this shifter with independently adjustable front/back and left/right throw which can be set between 85% and 45% of the OEM 8th Gen Civic shifter. Like our original k-swap shifter, shift knob height and location is independently adjustable. However, the exact position of the shift knob is easier to adjust thanks to a completely new clamp design. 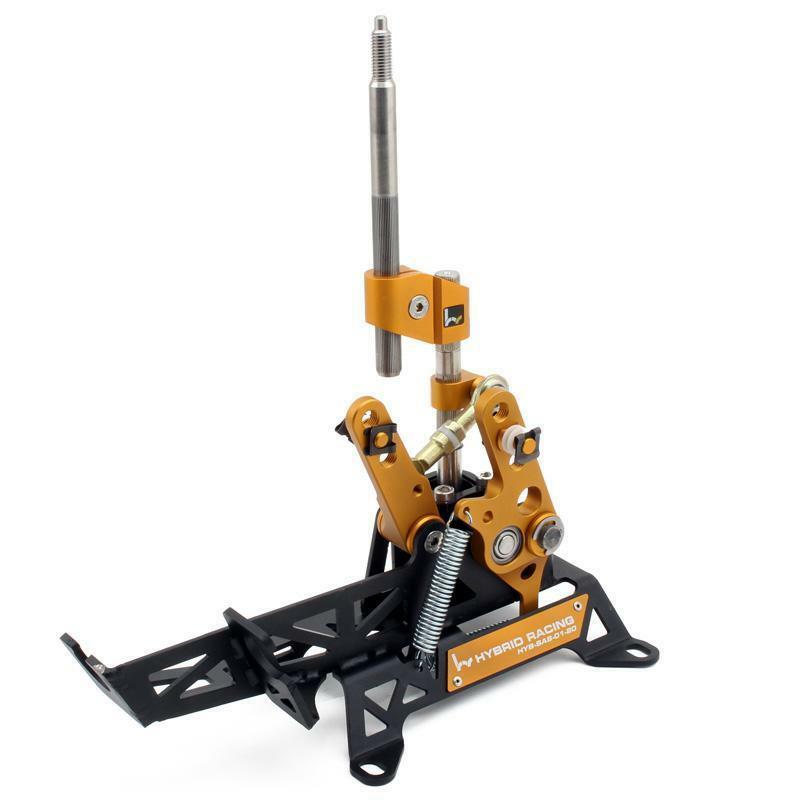 The Hybrid Racing bolt-in Short Shifter mounts to your chassis using (4) M8 bolts. Two bolts utilize the stock bolt holes behind the stock shifter location, and four holes must be drilled in the center tunnel for the other two bolts (no drilling is required if you are replacing a Karcepts shifter adapter plate). The drilled holes are located under the center console cover so that they are hidden once the shifter is installed. A rubber seal is provided with each shifter to help seal the cabin from noise, heat and debris under the car.